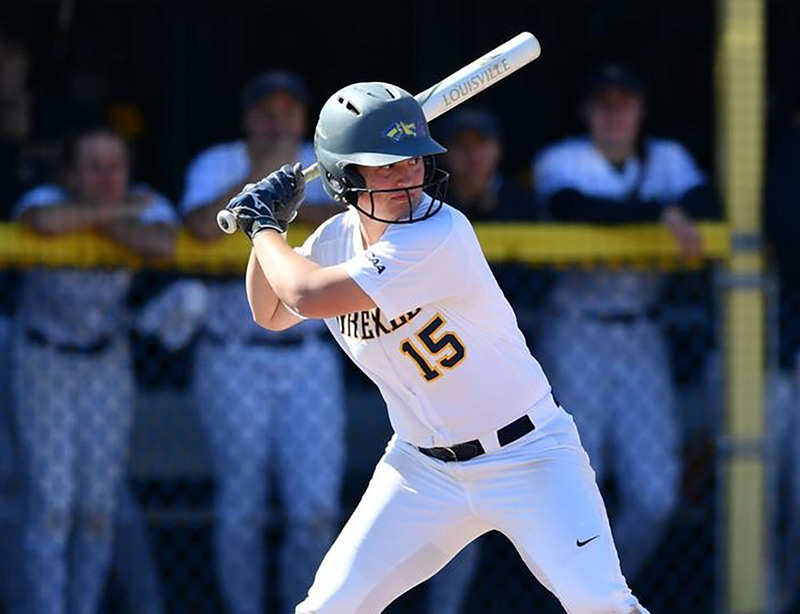 The Drexel University softball team started the regular season off strong with doubleheader wins against Coppin State University and Saint Peter’s University (Photograph courtesy of Greg Carroccio/Sideline Photos). After slightly lackluster performances in the Madeira Beach Spring Invitational and Hampton Blue and White Classic, the Dragons looked to bounce back in their last invitational to start off the year, the Maryland Invitational in College Park, Maryland. First up was Bryant University. This was yet another strong performance for junior Linda Rush, who hit a grand slam. Sophomore pitcher Brooklyn Daly also had a strong game, as she struck out nine batters, a career high for her. What really sealed the deal were back-to-back innings where the Dragons scored six runs, which led to their 13-6 win over Bryant. Despite Rush hitting another home run in this game, the Dragons could not get a win over the University of Rhode Island. Drexel could not mimic their success from the previous game, and in fact, Rhode Island used a similar tactic against them in this game. They had two four-inning games to get a 12-6 win over the Dragons. Bryant had another chance to defeat Drexel, but the Dragons had other plans. Despite their victory, however, Drexel was not able to create such an explosive game, as they only won 3-2. A walk off double by sophomore Kristi DiMeo sealed the deal in the seventh inning to lead the Dragons to the win. The Dragons ended the invitational with a match against Saint Peter’s University. With three hits and six RBIs, including a grand slam, sophomore Haley Hulitt led the Dragons to such a dominating win. A five-run fourth inning, which was led by a two-run home-run by senior Taylor M. Lee, sealed the deal over Saint Peter’s with a 10-0 win. As far as their start to the regular, single-game season, the Dragons exploded to get four straight wins. Drexel started it off with a game against the University of Delaware. Rush continued her hot streak with two home runs, while junior Hannah Walker contributed with one of her own. This led to their first CAA win of the year over Delaware, 9-2. The Dragons also played a doubleheader against the Blue Hens. In the first game, Drexel didn’t have the same powerful performance, but they still came out on top. A couple RBIs brought the Dragons to a 5-0 lead, but in the sixth and seventh innings, Delaware got four runs of their own. However, the Blue Hens could not come up with any more runs, and the Dragons won 5-4. In the second game, Rush hit yet another home run, her ninth of the season, leading the Dragons to a 5-2 win and a sweep of the Blue Hens. Next, Drexel had three home doubleheaders. Against Lafayette College, Drexel slightly edged the Leopards in the first game 7-6 and tied in the second game 8-8. DiMeo went 5-for-7 with a three-run home run, and Rush went 5-for-8 with two doubles and six RBI. Hulitt also hit a home run of her own in the doubleheader, getting her to three RBI. Their next doubleheader was against Saint Peter’s. Just as they did in the Maryland Invitational, Drexel demolished Saint Peter’s 10-3 in the first game and 18-0 in the second game. As usual, Rush and DiMeo hit home runs, but some new names added to the mix. Freshman Sarah Clinton and sophomore Megan Trivelpiece homered as well as junior Taylor Kent, leading to the trampling of the Peacocks. However, Drexel’s luck ended as the Dragons played their last doubleheader against the College of Charleston. In the first game, Drexel got demolished 11-2 even with a two-run home run from Hulitt. The second game was a different story, as the Dragons fought to a 5-3 win. The game was tied 3-3, but a home run from Clinton broke the game wide open and gave the Dragons the win. A final game against Charleston continued this hot streak. After an hour rain delay, the Dragons went back to work. After falling to a 3-0 deficit, Lee and Rush both smashed home runs to give the Dragons a 5-3 lead. It all went up from there, as the Dragons dominated 8-5. Drexel then moved onto yet another doubleheader, this time against Coppin State University. Just as the Dragons did against Saint Peter’s, Drexel dominated this doubleheader. Six RBIs by DiMeo and another Rush and Lee home run lead Drexel to a 17-2 win. In the second game, freshman Meghan Conroy threw a complete game while DiMeo had four RBI, for a total of 10 in this doubleheader, as Drexel won again, 7-1. The doubleheader against Coppin State was just the first of many to come against teams such as University of North Carolina Wilmington and La Salle University. The Dragons next game will be April 4 against Fairleigh Dickinson University.